A Poppy Net in Ferryhill has received a blessing in a special service. 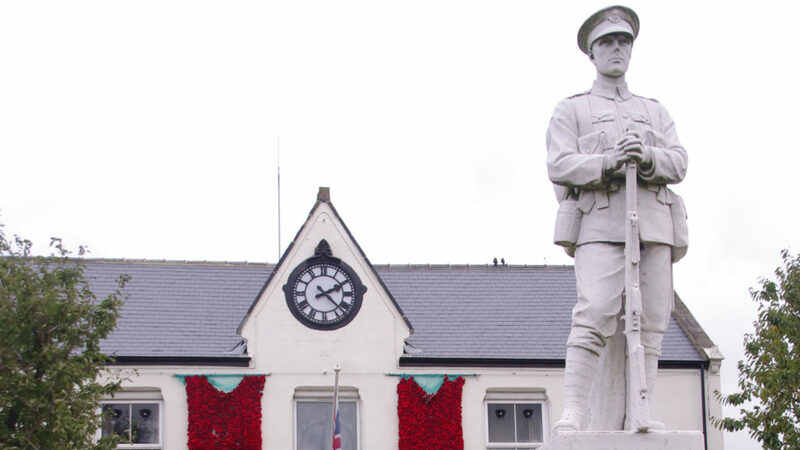 The net on the front of Ferryhill Town Hall was created to represent the 19,240 British Soldiers killed on the 1st July 1916 during the Battle of the Somme. A group of residents known locally as ‘Team Poppy’ originally created the net in 2017. Members of the group joined Councillors and residents to observe the blessing in the Town Hall gardens. The Blessing of the Net was carried out by St. Luke’s Church and was attended by the Lord Lieutenant’s representative, Dr Robert Mcmanners. The Last Post was played by Ex Bugle Major Garry Suggett. As part of commemorations marking 100 years of remembrance, Ferryhill Remembers in association with Ferryhill Town Council will be displaying the net which contains handcrafted poppies made by residents of West Cornforth, Ferryhill, Coxhoe, Bowburn and further afield including people from abroad, on the front of Ferryhill Town Hall for several weeks.